Do we feel unhappy because of our lack of familiar foods as we get diagnosed, or is there a more complex answer for the depression that frequently accompanies gluten sensitivity? The gut and brain communicate via the nervous system, hormones in the bloodstream, and the immune system. Some of the bacteria in our digestive tract (microbiome) can release neurotransmitters, just like our own neurons do, speaking to the brain in its own language via the vagus nerve. And what a mixture of bacteria that can be! There are variations in our microbiome based on age, illness history, and most importantly what we choose to eat. The combination of represented species that correlate highly with depression can be overlaid on the particular combination of species on the individuals. 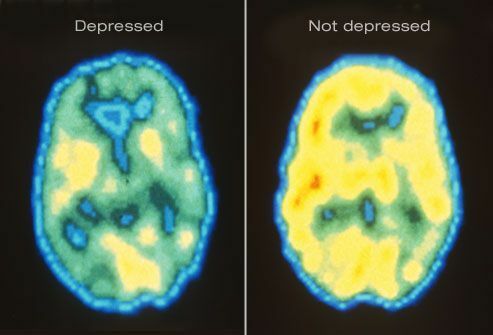 One could correctly identify those with depression 100% and 97% of the non-depressed controls. Yup, our internal bacteria can tell us if we are depressed. Gut bacteria respond directly to human neurochemicals (such as epinephrine). When we react to stress, we affect our bacteria and our mood. Celiac disease and Non-celiac gluten sensitivity are major stressors to our bodies. The body responds to stress (mental or physical) via the hypothalamic-pituitary-adrenal axis. The gut microbiome plays a key role in regulating our immune response. Thus the makeup of our gut microbiome could make the difference as to whether we are sick or well, both mentally and physically. Stress reduces the immune response. Strains of bacteria that affect the brain or behavior are called psychobiotics. Gluten can affect the amount of serotonin, which serves as a neurotransmitter in the brain giving us feelings of happiness, by limiting the availability of its precursor, an amino acid called tryptophan. There is already research that shows patients with celiac disease have intestinal dysbiosis, a condition where the bacteria that usually live in a patient are out of balance, and that this condition can be resolved after a gluten-free diet is prescribed. This means it is possible that gluten itself causes the bacterial imbalance, instead of celiac disease but more research need to be done to prove causation. Lactobacillus and Bifidobacterium species are known to produce GABA. Escherichia, Bacillus, and Saccharomyces produce norepinephrine. Candida, Streptococcus, Escherichia, and Enterococcus produce serotonin. Bacillus and Serratia produce dopamine, and Lactobacillus species produce acetylcholine. The most interesting case is GABA, the major inhibitory (calming) neurotransmitter in the nervous system. Large amounts of GABA are made by the bacteria in fermented food and typical probiotic capsules. GABA is anti-inflammatory in the gut itself, decreasing the release of inflammatory cytokines. This is a plausible mechanism by which certain probiotics decrease inflammation, aids symptoms of conditions such as irritable bowel syndrome, and have direct communication via the neurotransmitter GABA to the brain through the vagus nerve. Probiotics are thought to affect how well pathogens stick to the walls of our gut. Current treatments of gluten sensitivity include the classic gluten-free diet, FODMAPs diet, probiotic supplementation and nutritional supplementation. With my patients, I start a newly diagnosed gluten sensitive patient on three supplements.